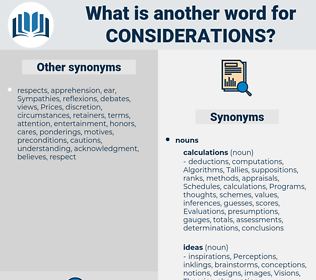 What is another word for considerations? discussions, actions, ratios, sides, Areas. examinations, Studies, musings, deliberations, examination. secretariat, facteurs, positions, insights, influences, subjects, sites, developments, EXAMS, forces, IMPACTS, themes, dots, PTS, context, dimensions, points, determinants, affairs, drivers, features, PORTS, problems, reviews. explanatory, representation, criterion, Criteria, reason, reasons, context, justification, analysed, observation, dimension, dimensions, rationale, commentary, reasoning, point, points, contributors, relations, comment, comments, sections, determinants, motivation, component, declaration, analyzed, questionnaire, strategic, analyze, complementary, implications, analysing, particulars, accommodate, obligations, Analyzing, arguments, side, requirement, requirements, aspect, integrate, stakes, recognize, relationship, relationships, grounds, stake, insight, additional, transfers, supplementary, appearance, ingredients, evidence, narrative, needs, parts, element, score, input, inputs, environment, endpoints, feedback, basis, parameters, benchmark, benchmarks, area, Areas, setting, background, affairs, des, ground, spots, avenues, drivers, driving, remarks, marks, challenge, challenges, pieces, AGDM, features, finding, PORTS, enjeux, blocks, material, Queries, problems, considered, Considering, observations, review, reviews, Examining, account, reviewing, exam, screening. conditions, Recommendations, circumstances, attention, importance, Consultations, Evaluations, proceedings, Examined, reviewed, preconditions, investigations, contributions, estimations, descriptions, decisions, restrictions, conceptions, details, talks, respects, directions, Perceptions, instructions, preoccupations, repercussions, things, predictions, constraints, hesitations, convictions, justifications, contexts, specifications, Negotiations, objections, effects, evaluated, prosecutions, assessment, assessments, commitments, Suggestions, purposes, minds, regards, indications, conclusions, explanations, rationales, contents, terms, fields, Assessed, Commentaries, ways, constituents, notions, Orientations, reservations, options, propositions, concepts, services, coefficients, restraints, Necessities, understandings, reflexions, projections, Visions, persuasions, notices, motivations, calculations, sub-factors, principle, principles, appraisals, stakeholders, instances, costs, characteristics, promotants, check-ups, facteurs, manifestations, predictors, disregard, debates, palpitations, proposals, indicators, perspectives, dynamics, formulations, raisons, Measures, metrics, provisions, consequences, taken, priorities, Hearings, reflexiones, careful, Categories, politics, directives, specifics, trends, decides, opinions, balances, readings, situations, portions, recitals, counterparties, allegations, sensitivities, positions, limitations, Risks, allocated, applications, agendas, troops, counterparts, PROSPECTS, Measurements, merits, qualifications, precedes, attributes, accounts, viewpoints, aspectos, prerequisites, means, Judgments, Envisaged, occasions, checks, intakes, alternatives, judgements, assets, heed, scores, steps, analyzes, safeguard, safeguards, Whereas, optics, estimates, doubts, document, Uncertainties, ratings, remarques, sectors, environmental, stresses, rethinking, Particularities, insights, Resources, forecasts, sub-items, headings, impediments, Opportunities, Sentiments, dossiers, sources, outcomes, Ideas, Possibilities, trials, nutrients, obstacles, influences, agrees, Attitudes, strands, principals, objectives, values, Strains, arrangements, labels, subjects, threats, imperatives, work, tasks, enablers, words, Incentives, motion, Motions, statements, specificities, auditors, approaches, Environments, Standards, ordering, segments, sites, keeping, Analytics, developments, stressors, Peculiarities, FACETS, Sensibilities, actors, wordings, premises, senses, subparagraphs, EXAMS, Activities, preambles, variable, variables, exchanges, Remedies, misgivings, sales, advantages, compounds, watch, references, demands, targets, looks, Foundations, Exigencies, clauses, traits, settings, streams, domains, motives, payments, benefits, counts, lists, stages, Studios, forces, Lights, IMPACTS, objects, Promoters, Tracks, Surveys, causes, Fears, facts, fronts, Guidelines, cases, expects, making, stitches, fundamentals, designs, trusts, agents, ends, practices, burdens, motivators, Phases, inflows, highlights, pillars, Branches, plans, changes, sightings, Weights, VISAS, rule, rules, Shown, events, Difficulties, tanks, modalities, speeches, pressures, settlers, Faces, Ones, reserves, themes, dots, phrases, Indices, Subsidies, Angles, tenets, experiences, results, riders, motifs, Operators, outlets, spheres, players, aims, genres, works, supplies, Worries, schemes, sizes, bullets, hold, qualms, bits, Realities, Genders, Beliefs, data, kinds, sexual, materials, messages, patterns, walks, answers, levels, places, Goals, flows, 35, members, PTS, Cells, Criteria, reasons, type, types, pm, sexes, Bases, feelings, units, Policies, dimension, dimensions, vi, figures, Forms, points, contributors, comments, sections, determinants, LINEs, complementary, implications, particulars, arguments, requirements, stakes, grounds, transfers, ingredients, needs, parts, inputs, environment, endpoints, parameters, benchmarks, affairs, spots, avenues, drivers, remarks, marks, challenges, pieces, features, PORTS, blocks, Queries, problems, Considering, observations, review, reviews, account, reviewing. 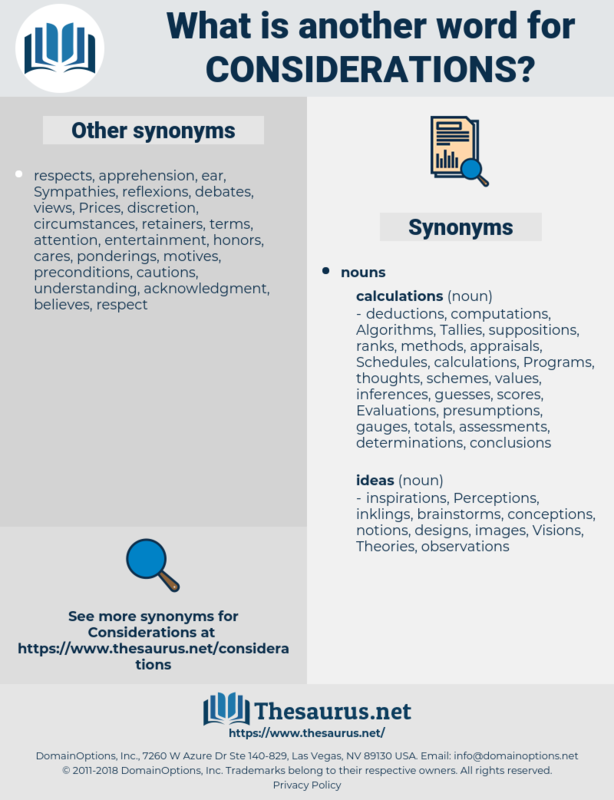 brings, seeks, subjects, Does, points, comments, remarks, features, Queries, consideraciones, Considering, observations, examination, review, reviews, reviewing. But there were other and terrible considerations. The maharaja has broken caste without suffering any disadvantage, and has discovered that other considerations are more important.